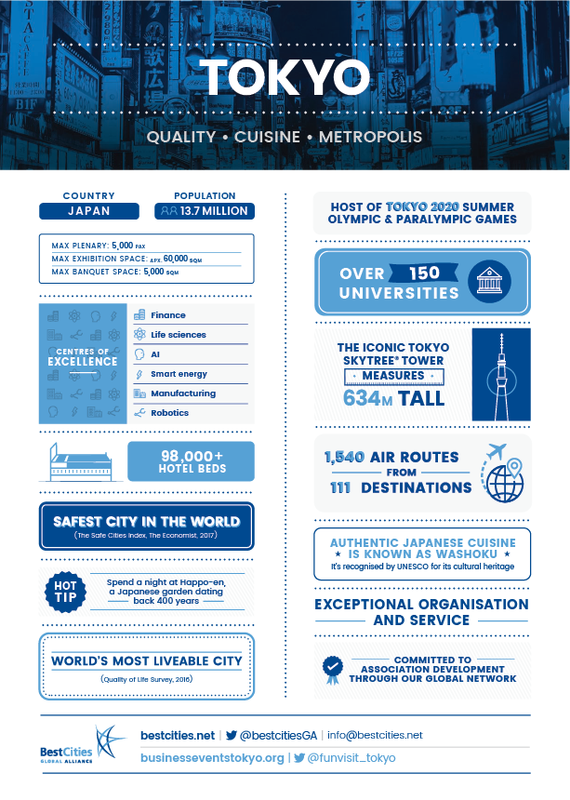 Why Host Your Event In…Tokyo? Home>All News>Why Host Your Event In…Tokyo? Tokyo hosted over 100 international meetings in 2017 which ranks Japan’s capital city fifth in the Asia Pacific region according to the latest ICCA statistics. Preparing for the Olympic and Paralympic Games in 2020 has raised Tokyo’s excellent reputation as a host city even higher.
" The Japanese are renowned for their good nature and unique temperament, providing top-class service with a smile. The attention to detail and the ability to anticipate what is needed are just a few of the qualities you are first to notice anywhere in Japan.	" Tokyo’s two modern international airports handle all major carriers and provide great access to delegates from around the globe. Narita Airport offers over 1,540 international flights from 112 cities and Haneda Airport in the city centre offers over 690 flights from 32 cities each week. More international flights are scheduled ahead of the Olympic and Paralympic Games in 2020. As a business capital, Tokyo constantly welcomes government dignitaries and business leaders, offering the highest quality of service and organisation. 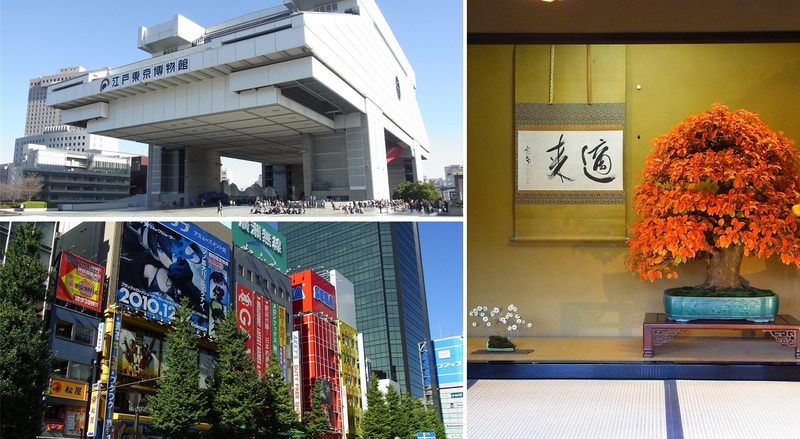 The 98,000 guest rooms in Tokyo offer a wide choice of accommodation, from budget to luxury international brands. A variety of multi-purpose venues can fulfil the specific needs of every meeting. 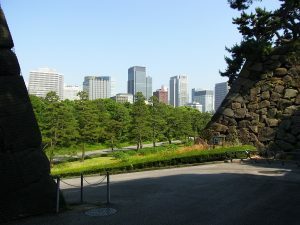 Despite being a huge metropolis, Tokyo has a very low crime rate and has been ranked No. 1 in the top 10 safest cities in the world by the 2017 Economist Intelligence Unit Report. One can walk the streets or take the subway at night and feel completely safe. Many people visiting Tokyo for the first-time comment on the cleanliness of the city as well – the roads are incredibly clean, the air is clear and the tap water is safe to drink. Asakusa District, the Imperial Palace, Meiji Jingu Shrine and many more carefully preserved sites represent Tokyo’s 400-year history, along with the new icon TOKYO SKYTREE®, the world’s tallest free-standing tower. State-of-the-art skyscrapers and neon lights intersperse hidden temples and shrines. Traditional arts and cutting-edge design and technology continuously take on new shapes, making Tokyo the ultimate combination of modernity and tradition. 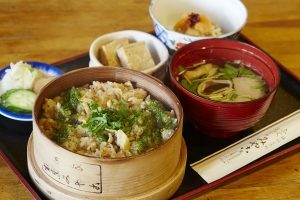 Washoku, or authentic Japanese cuisine, including globally popular sushi and tempura, has been designated by UNESCO as an Intangible Cultural Heritage. There are more than 80,000 restaurants in Tokyo, and the city boasts the most Michelin stars in the world. The exquisite quality and wide variety of dishes, from washoku to world cuisine, make for an unforgettable experience. The Japanese are renowned for their good nature and unique temperament, providing top-class service with a smile. The attention to detail and the ability to anticipate what is needed are just a few of the qualities you are first to notice anywhere in Japan. Our most recent event in Tokyo was in 2016, the International Continence Society (ICS) Meeting which welcomed over 2,000 delegates – a new attendance milestone. 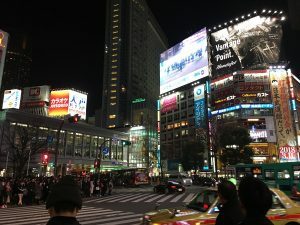 The reason why every event held in Tokyo becomes a tremendous success is hidden in the attractiveness of the destination, the local knowledge and expertise in any scientific area that you may think of and the collaboration that is easily fostered between local key opinion leaders and international delegates. 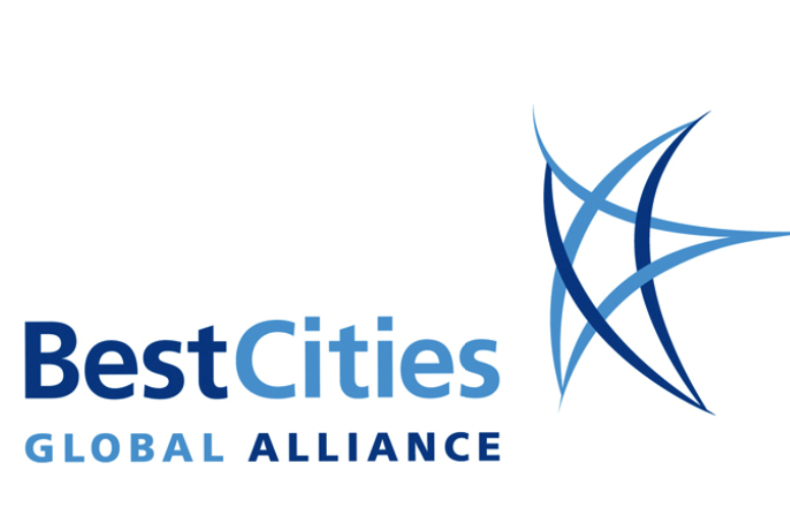 With partners as Business Events Tokyo, a BestCities Global Alliance member, we ensure the smooth communication with local suppliers and that the best of the best is on offer to our clients. For years we have seen the magic of the destination transform each event we held there. Over 140 universities, that include the University of Tokyo which is home to 10 Nobel laureates, are located in Tokyo making it a powerful draw to many participants and exhibitors alike. Further to that, in the long-term vision (2014-24), the Tokyo Metropolitan Government committed to support future business events held in Tokyo. The main focus is on providing financial and in-kind support for large association meetings to ensure the success of each and every event held in Tokyo. Refer your delegates to why they should visit your congress taking place in Tokyo here.